Click on your bank location below to access detailed card information or to apply. Contact a Premier Banker at a location nearest you to apply or learn more. Click on your bank location to access detailed product information about the cards above. *All cards available upon approval. Full card terms and conditions can be found on the links below or by contacting a Premier Banker at a location nearest you. Please note: Premier Banks has partnered with Elan Card Services. When you click one of the location links, you will be routed to the Elan Card Services site for a description of applicable terms and conditions. Approval and availability of terms and conditions are subject to Elan Card Services. The Business Debit MasterCard®* allows business deposit account owners to make MasterCard® purchases using the funds in their business checking accounts and have ATM access as well. The card appeals to smaller businesses, such as small office/home office sole proprietors with five employees or less, and with revenues under $1 million. The card can also be offered to corporations, partnerships, for-profit, and not-for profit associations. *Contact a Premier Banker at a ​location nearest you to make sure your card will be accepted where you are traveling. *Available upon approval. ** Not all transactions are available at every ATM location. Certain restrictions may apply. Legal Disclaimer: My Mobile Money App is available to debit card customers only. My Mobile Money is an app offered in partnership with Elan Financial Services. Available on iPhone® and Android™ apps. Subject to availability requirements. iPhone® is a federally registered trademark of Apple Inc. Android™ is a trademark of Google Inc. Elan Financial Services, Apple Inc. and Google Inc. are not Equal Housing Lenders or Members of the FDIC. 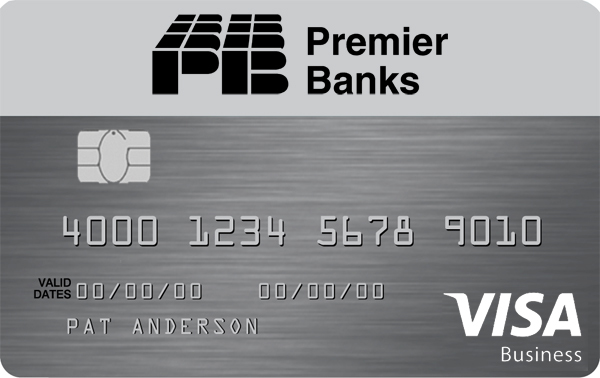 Premier’s secure and convenient VISA® Gift Cards are great for employee travel, perks, incentive programs, bonuses, and holiday gifts. For balance information, call 866-586-4438 or visit My Gift Card Manager.